Modifications: I used a very large onion, 2 carrots, and 3 stalks celery, and I think we also had more meatballs because I just used some pesto from the freezer and the package of ground chicken was .8lbs. Oh, also used crushed tomatoes instead of diced. Notes: Everyone was really happy with this meal! It was almost like spaghetti and meatballs because I think our soup wasn’t as brothy with the added veggies. We made bread on the side but didn’t even really need it. Definitely a satisfying meal on it’s own! (I said love for the kids, while they did not RAVE over this meal, I’d still say it was a solid hit with them and they were happy to eat it, so that counts as a love in my book). 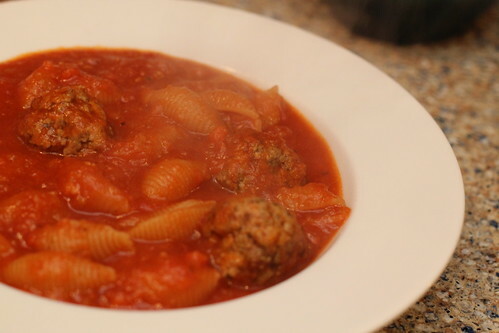 I was a bit skeptical about the meatballs and pasta cooking in the soup itself but hey, it worked. This entry was posted in carrot, celery, chicken, garlic, one dish meal, onion, panko, pesto, soup, tomatoes, triple love. Bookmark the permalink. His new thing is that he PANICS over the sight of a diced onion in his meal. Freaks out. So I love that this recipe uses an immersion blender to grind up those bad boys. Thank God Louie eats everything, our little carnivore. Last night I made tomato soup and grilled cheese (I know, such an amazing culinary feat) and he begged me for some sort of meat so I heated him up a huge pile of leftover taco meat from the night before. Seriously. Ridiculous.